Green Supply Chain News: Will Sustainable Products and Strategies be the Key Source of Revenue Growth? Interestingly, given the stated importance of sustainability, more than half (56%) of respondents said that it was more expensive to be a sustainable business. Only 16% disagreed with that statement. With a high percentage of companies pushing sustainable supply chain strategies in one form or another, just how important are those initiatives, if at all, to business growth? That is among the questions the consultants at Accenture tried to answer with a survey of about 250 senior business executives from across the globe. The results were interesting – you can find the full report here: Long-Term Growth, Short-Term Differentiation and Profits from Sustainable Products and Services. Before getting to the meat of the data in terms of sustainability’s contribution to growth, the survey asked a general question about how important sustainability is overall to the business. Overall, 44% of respondents said sustainability was critical to the business, and another 48% said it was very important. 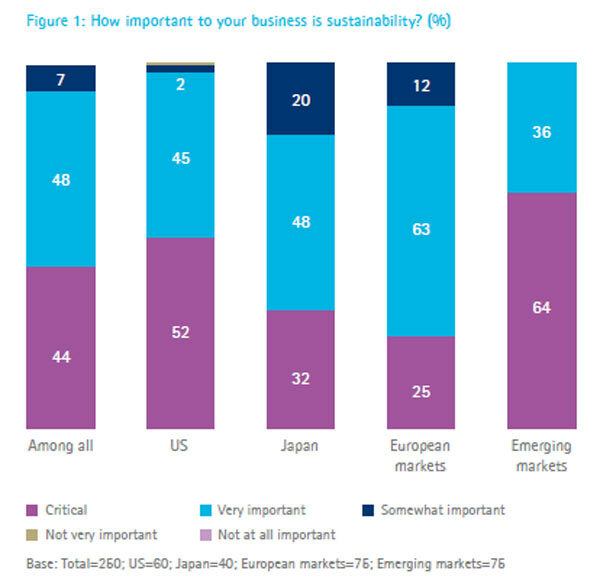 But that masked some regional differences, and perhaps somewhat surprisingly, 20% and 12% of respondents in Japan and Europe, respectively, rated sustainability as just somewhat important, versus almost no respondents from US or emerging market companies. We might have guessed the exact opposite result. Perhaps the most optimistic finding from the survey was the extent to which businesses now appear to accept that sustainability is a commercial necessity, whereas in the past, compliance and cost considerations were dominant,” the report notes. That’s because companies overall believe that it is consumer demand for sustainable products and initiatives that is the most important factor in pursuing sustainable strategies, as seen in the graphic below. Again perhaps surprisingly, only 7% of respondents listed “Reducing overheads such as energy and materials cost” the top factor in adopting sustainable strategies and products. The report notes that in a similar study in 2010, the leading motivator for CEOs to take action on sustainability was brand and reputation. 72% of CEOs cited this factor, versus only 39% who pointed to customer demand just two years ago. This point was made again in a related question, in which the respondents were asked very specifically whether sustainability initiatives were more growth or efficiency/cost oriented. 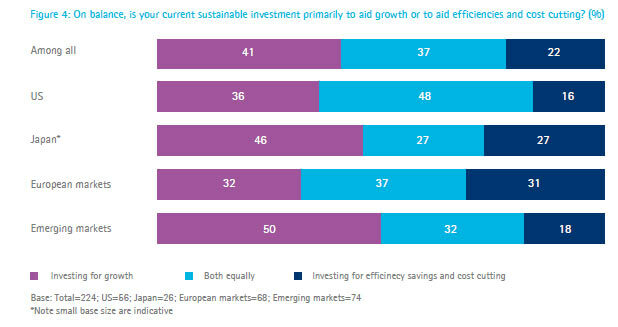 As shown below, “investing for growth” far exceeded efficiency/cost cutting, although “both equally” about equaled the total responses for growth. 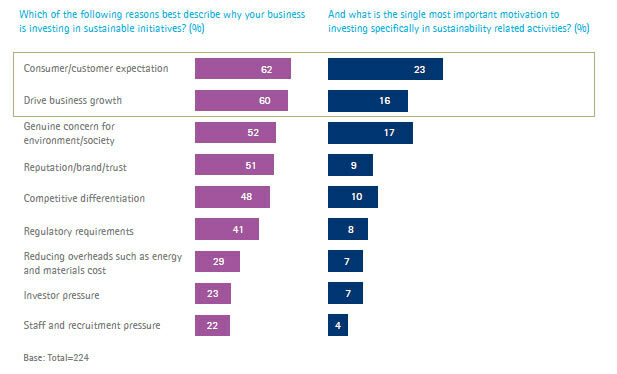 And interestingly, given the stated importance of sustainability, more than half (56%) of respondents said that it was more expensive to be a sustainable business. Only 16% disagreed with that statement. It adds that achieving a level of scale in both demand and capabilities will be key to solving this challenge. Do you or your company now viewed sustainability as a real growth engine? Or is it mostly about costs and PR? Let us know your thoughts at the Feedback button below.